In 2017, we learned many lessons from our conversations with future and emerging leaders during roundtables, town halls, and Summit workshops. We’re taking what we’ve learned from these inspiring and insightful conversations to power both our current and future programs. Here are some of the new programs we’re working on in 2018. To lift up emerging leaders who have already begun to demonstrate impact in their communities, we’re partnering with the University of Chicago’s Harris School of Public Policy to develop a special master’s program in international development and policy. Twenty-five Obama Foundation Scholars will come to Chicago from around the world to develop their research, analytical, and applied skills. 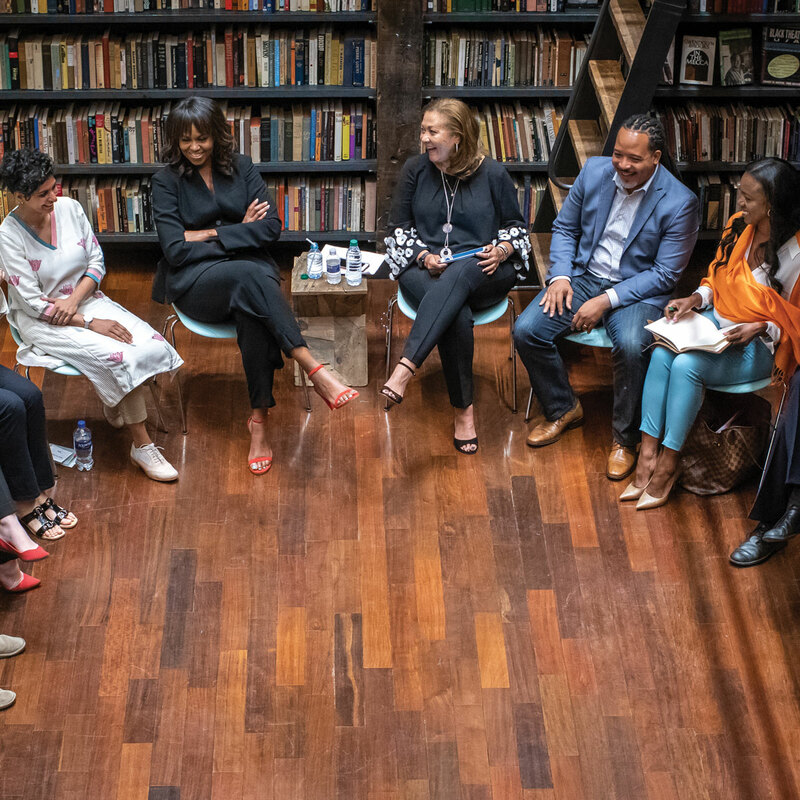 At the same time, a dozen international Obama Foundation Scholars will go to Columbia University for one year to work with academics and expert practitioners to identify tangible solutions to real-world problems. Both programs will be supplemented with rich leadership development, mentoring, and networking opportunities provided by the Foundation. The first cohort of Scholars will begin their studies in August 2018. By inspiring, empowering, and connecting 200 emerging leaders from across Africa, we hope to build a new generation of innovative, ethical changemakers and role models for communities, countries, and the entire continent. The one-year leadership development and civic engagement program launched in July 2018 with a five-day convening in Johannesburg, South Africa. The Foundation is planning similar programs, tailored for each region, in Asia, Europe, and Latin America. Building on the success and learnings from our pilot Training Days, we are testing more focused day-and-a-half long trainings in the fall of 2018 designed for an audience that is ready to take the first step in their civic journey. In parallel, we are piloting the Community Leadership Corps, a six-month leadership development program for young people ages 18-to-25 who are already involved and ready to take on a more active leadership role in their communities of Phoenix, Columbia, and Chicago. MBK Alliance’s work to reduce barriers and expand opportunity for boys and young men of color continues to gain momentum in hundreds of communities around the country. In April 2018, we launched the MBK Community Challenge Competition, a pilot program that aims to grow the impact of community-based solutions that measurably improve life outcomes for boys and young men of color. The competition’s focus is on reducing youth violence, growing the pipeline of mentors to young men of color, and strengthening initiatives that will lead to lasting local change. Winners will be announced in the fall. Our programs aim to touch thousands of people interested in changing their communities for the better. But we don’t just want to reach an audience—we want to build a lasting network of new leaders who can lift each other up as they pursue progress. We’re developing digital platforms to help program participants stay connected and build stronger ties. These platforms will connect participants with similar interests or similar goals, give them a vehicle to share their work, and help them achieve more together than they can alone. Building a network of people working for change shouldn’t just apply to program participants. We’re also planning to launch a membership directory that will allow us to recruit and interact with the millions of people around the world who have expressed interest in our work. Depending on their desired involvement, members will be offered a wide variety of benefits—including invitations to events, early looks at new technologies and programs-in-progress, and access to special-edition Foundation “supplies”—our stylish and useful Foundation-branded items.